This beautiful gold Trumpet miniature makes a wonderful holiday decoration for the Christmas tree, gift wrap or room decoration. A gift that would be appreciate by the Trumpet player in your family or among friends. 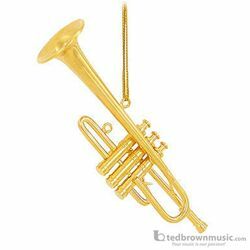 This miniature includes such fine details that you would find on a full size Trumpet which includes the mouthpiece, valve casings, pistons, third valve slide, tuning slide and bell. Size is 2.50", Brass Construction, Gold Lacquer Plated.